The beautiful Daria collection stands out in any bathroom with strong, clean lines and elegant raised panels. There's plenty of cabinet space, the doors are soft-close construction, and chrome detailing completes the look. Daria deftly combines the function of today with a nod to the elegance of the past. It's the new modern classic styling with a contemporary twist. Beautiful transitional styling that complements any bathroom. Easy Wall-Mounting Design. Minimal assembly required. Two (2) soft-close doors. The Lexington 20-inch linen tower in light espresso is a beautiful combination of modern and traditional design. Constructed of solid birch wood and birch veneers, tinted glass doors, brushed nickel hardware, soft-close drawer guides and hinges. The linen tower has 3 open shelves, 1 drawer and 1 enclosed cabinet for all your storage needs. Tall, sleek and modern, this elegant Fresca Bathroom Linen Storage Cabinet is finished in a deep espresso paired with stainless steel handles. Multiple drawers and a soft-closing cabinet door provide plenty of extra space to house linens and other household items, while the backless design helps ensure adequate ventilation for stored items. Its vertical, freestanding frame offers a small footprint and is easy to place anywhere that suits your space. Daria Wall-Mounted Storage Cabinet in Dark Espresso The beautiful Daria collection stands out in any bathroom with strong, clean lines and elegant raised panels. There's plenty of cabinet space, the doors are soft-close construction, and chrome detailing completes the look. Daria deftly combines the function of today with a nod to the elegance of the past. It's the new modern classic styling with a contemporary twist. 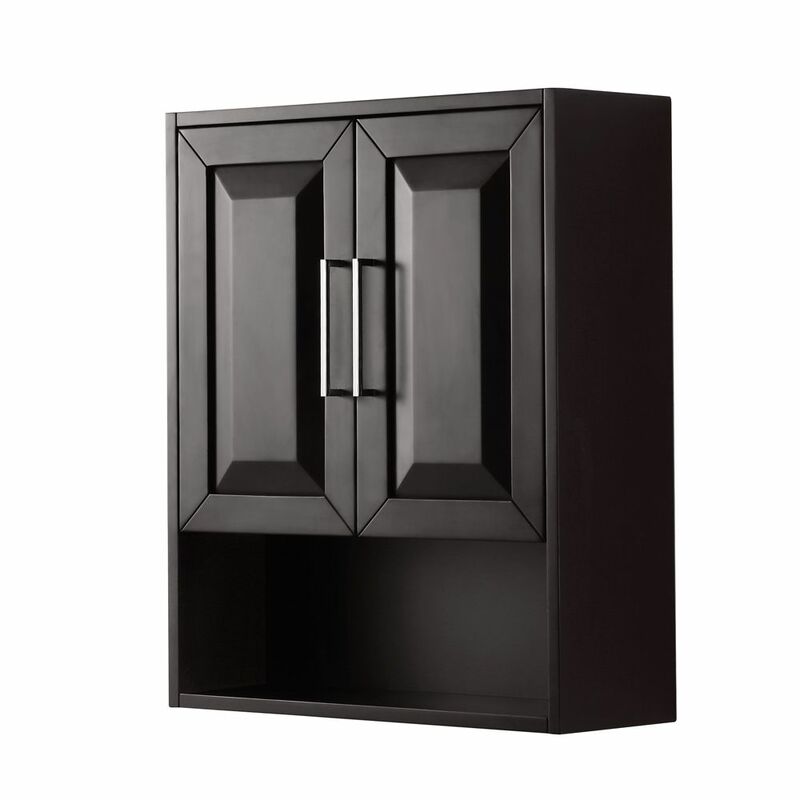 Daria Wall-Mounted Storage Cabinet in Dark Espresso is rated 3.0 out of 5 by 2. Rated 1 out of 5 by Mike from Wood split in a corner. They tried to patch before paining one of the doors but the patch is ver... Wood split in a corner. They tried to patch before paining one of the doors but the patch is very visible through paint. White colored fingerprints that are practically impossible to remove. Minor scratches every where. Rated 5 out of 5 by TerBear from We've purchased two of these cabinets. One for the guest bathroom in white and one for the jack-a... We've purchased two of these cabinets. One for the guest bathroom in white and one for the jack-and-jill bathroom in dark espresso. We love them. Perfect cabinet when there was minimal storage before!! They are of high quality and look amazing! !